At some time or other, everyone runs into times of financial difficulty, perhaps due to unexpected expenses, temporary layoffs, or even when faced with the need to generate cash to pay for a family vacation. In situations like these where a significant amount of cash has to be raised quickly, one great way of doing it is to arrange for a pawn loan at our Mesa pawn shop. In addition to the fine citizens of Mesa, we also welcome everyone from towns and cities in the surrounding area such as Chandler, Gilbert, Apache Junction, and Tempe, or wherever else you happen to live in the great state of Arizona. The great thing about a gold pawn loan is that you don’t have to surrender ownership of your valuable gold pieces, but you can still get the cash you need in the meantime, to get you through a financial rough spot. By arranging a loan with our pawn shop, you would only have to agree to a three-month contract. To keep that in good standing, it would only be necessary to at least pay on the interest portion of each monthly installment, although paying on both interest and principle would be the preferred approach, because it steadily works toward lowering your outstanding balance. What Kind of Gold is Good for Cash? The easy answer is all of it! Think about the history of gold and you’ll realize why it’s all good for cash. Historically, it’s been used to back up countries and federal organizations as its value is static and can be trusted to withstand the test of time. Alma School Pawn and Gold believes in the inherent value of gold and pays the most for it. Our organization owns a large amount of gold and has more confidence in precious metals than ever before. We can accept almost any kind of gold pieces you have, including gold coins, gold scrap pieces, gold jewelry, wristwatches with gold content, and many more similar items. 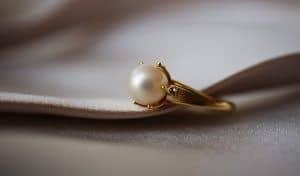 When you bring in your valuable gold items, they will be appraised on the spot in your presence by our precious metals expert, who will also consult the New York spot market to determine current market prices for your gold or other precious metals. Then you will be given the highest possible payout amount, and the 90-day loan term will commence. If need be, that time frame can be extended by simply paying on the interest each month, and at the end of the repayment period, you would receive your gold valuables, thus completing the pawn loan. Some of the most common items we receive in our pawn shop store include gold coins issued by the various governments of the world, and no matter how expensive these are, we can advance you the cash based on their fair market value, even if you bring us an entire collection to be pawned. Just a small sampling of these include South African Kruggerands, American Gold Buffaloes, American Gold Eagles, and Canadian Maple Leafs, although there are many more gold coins in circulation, and all of these have great value because of their gold composition. We are here to serve you, and to help you get through periods of financial need, so you have our pledge that you will be treated fairly, and with the kind of superior customer service that each and every one of our loyal and valued customers deserves. We look forward to seeing you at our Mesa, Arizona store in the very near future.